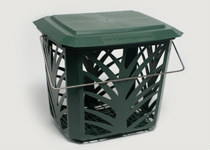 MaxAir Bin, the worlds best kitchen food scrap collection system, removes the yuck factor. Use with 8L certified compostable liner product code BG187015. Some of the practices we grew up with, such as disposing of our kitchen refuse with the general weekly waste collection, is harmful to our environment. Society is however realising what happens in landfills and the true value of the organic materials we have traditionally wasted. For most people collecting food scraps or putrescibles at home or in the workplace is very unpleasant. However the MaxAir system has overcome the yuk factor and has proven in many countries to be the world’s leading user-friendly system for collecting food scraps and separating organic waste otherwise sent to land fill. This simple special bin is the key or link to many significant ‘downstream’ environmental benefits making collections even pleasant and planet friendly. It consists of a small-ventilated bin with a unique BioBag liner made from starch based material designed to ‘breath’, allowing oxygen to reach the organic waste so the contents decomposition aerobically. This minimizes odour, moulds and flies while still an effective barrier against bacteria and viruses. Bin ventilation also allows moisture to evaporate through the bag wall dehydrating the contents by around 20% for the average family. With water content reduced the waste is better conditioned for handling and composting. 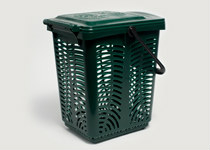 The MaxAir bin is hygienic, easy to keep clean without the excessive use of detergents or water as with regular bins. The ‘reduced’ contents, bag and all can be placed in the compost or a green waste collection system. The bins have a flush wall-mounting slot or are typically used under or on the bench top. Everyone loves the MaxAir bin system; we constantly receive only positive feedback and confirmation that “it really does work so well”. Organics are the best waste stream if turned into valuable compost, but if not, organics are one of the worst components of a landfill. Being mostly water the water releases filtering through the landfill trash collecting heavy metals, chemicals, poisons, carcinogens and other pollutants. Modern Landfills are lined with a membrane but it is only a matter of time before that will rupture or leak. A landfill containing organics is a long-term pollution time bomb, a liability for generations. The accumulated cocktail of toxic leachate will leak into our water systems and soils. It is also only a matter of time before ‘Councils’ will be held accountable, prosecutions may follow when communities, farmers and aquaculture industries are polluted. Organics and therefore leachate can be removed form landfill if MaxAir is used. Due to the dehydration effect of the MaxAir system, cleaner collections, trucks and cleaner commercial compost facilities are the result, reducing health, safety and hygiene issues for the carriers and compost plant operators. The lower water content also benefits worm farms or the commercial compost processor, as the water content in putrescibles is usually higher than they would like. Another significant benefit from the 20% to 40% reduction in weight from the dehydrating evaporation through the BioBag wall is the saving to council and the ratepayer. Collection services when they pick up, will pick up 20% to 40% less. MaxAir removes organics from landfill using the BioBag bin liners. These are certified compostable in home and commercial composts, GE (GMO) free, they maybe used in organic farm production, for food contact and are safe for animal feed like worm or pig farms, even sea creatures can digest BioBag’s. Landfills that contain organics are unstable; the covering ground cannot be built on so they are not useful when full. With diversion of compostables from landfill by up to 50%, the life of a landfill, or the need for a new one, can be extended by decades. This presents very significant cost saving opportunities for councils and ratepayers. TallAir Bin, kitchen food scrap collection for the heavier user, removes the yuck factor. Use with 10L certified compostable liner product code BG187020. Some of the practices we grew up with, such as disposing of our kitchen food scraps with the general weekly waste collection, is harmful to our environment. Sending organic refuse to landfill is not just a waste of valuable organic materials but causes serious problems in landfill. Organics in landfill generate massive quantities of climate change gasses, cause the accumulation of toxic leachate that can leak into our water systems and soils and when the landfill is full results in unstable land. Landfills are becoming increasingly expensive to operate and finding the next one presents huge costs, all of which we as ratepayers must fund… will the next landfill be near you? For most people collecting food scraps at home or in the workplace is very unpleasant. However the ventilated bin system has overcome the Yuk factor and has proven in many countries to be the world’s leading user-friendly system for collecting food scraps and separating organic waste otherwise sent to landfill. The simple yet special bins on this stand are the key or link to many significant ‘downstream’ environmental benefits making collections even pleasant. The MaxAir and TallAir ventilated bins need the unique BioBag liners made from Mater-Bi, this special material is designed to ‘breath’, allowing oxygen to reach the organic waste so the contents decompose aerobically. This minimizes odor, moulds and flies while still an effective barrier against bacteria and viruses. Bin ventilation also allows moisture to evaporate through the bag wall dehydrating the contents by around 20% for the average family. With water content reduced or the ‘slop’ removed the waste is better conditioned for handling and composting. The ‘reduced’ contents, bag and all can be placed in the compost or a green waste collection system. The bins have a flush wall-mounting slot or are typically used under or on the bench top. Everyone loves the MaxAir bin system; we constantly receive only positive feedback and confirmation that “they really do work”. Tests by the Norwegian University of Agriculture found that with the MaxAir system there was no bad smell detected. Airborne moulds were lower and CFU (colony forming units) were significantly lower. With organics removed form the general waste a decrease in animal attacks on curbside rubbish bags is also a typical outcome because of the reduced smell. Collection of organics is more problematic; there are issues of convenience, cost, the yuk factor, infrastructure, health, safety and hygiene, for consumer, carriers, compost plant operators and city authorities. The MaxAir system provides internationally proven solutions to all these issues. It is simple, convenient, hygienic, cost-effective and an environmentally sound way to collect and process organic and food waste. It out performs all other systems achieving very high levels of householder satisfaction wherever it is used, one of the key reasons some countries in Europe achieve almost 90% diversion of total waste from landfill.